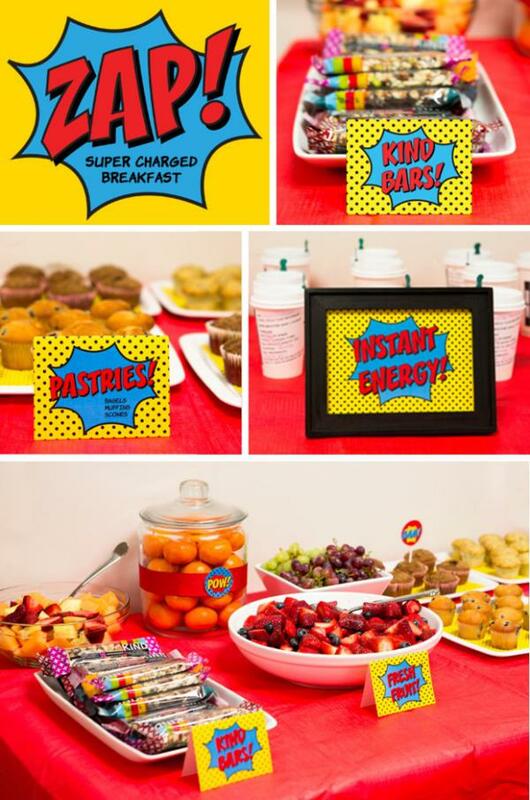 Staff TEACHER Appreciation Week Superhero Party! 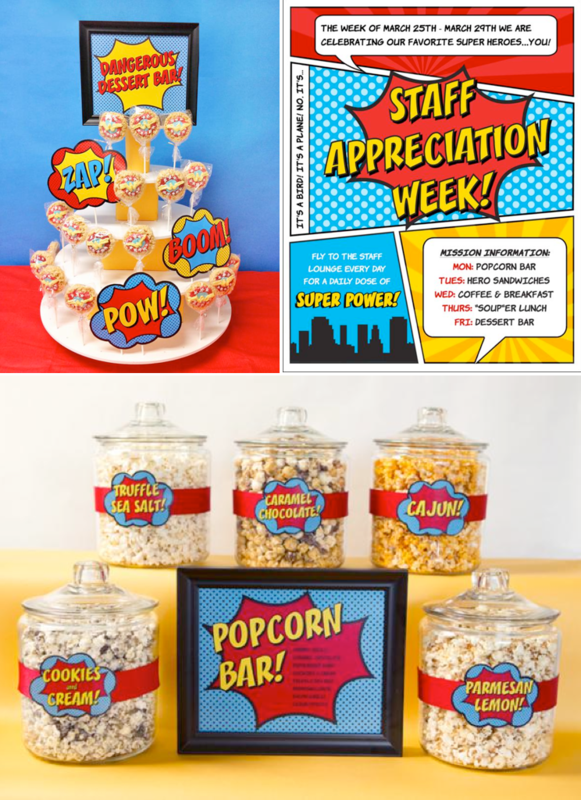 This inspiring STAFF APPRECIATION WEEK SUPERHERO THEMED PARTY was submitted by Maegan Birr of Scrapaholics. What a fabulous idea! This wonderful party took place in the teachers lounge at school. Each day the teachers enjoyed a different element of being “super heroes” (Monday- “POP” popcorn bar, etc). See the full party details at the bottom of this post! 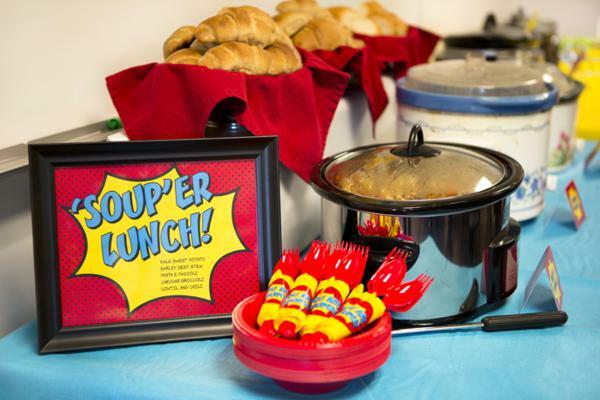 Here’s what Maegan said about planning the event- “A week and a half before Superhero Staff Appreciation Week, all of the teachers and staff received an invitation in their mailbox, along with a lunch preferences questionnaire and drink order form. Superhero posters were our main decoration this year. John Wolfe, a local photographer and fellow parent, took pictures of everyone decked out in a customized superhero cape and mask from Kid Kapers. I have been eyeing those capes for months and was thrilled that she had time to make a Superman style cape with an M for Mann Elementary. It couldnt have been more perfect. Did you know you could have capes customized? How fun is that?! I love Etsy. 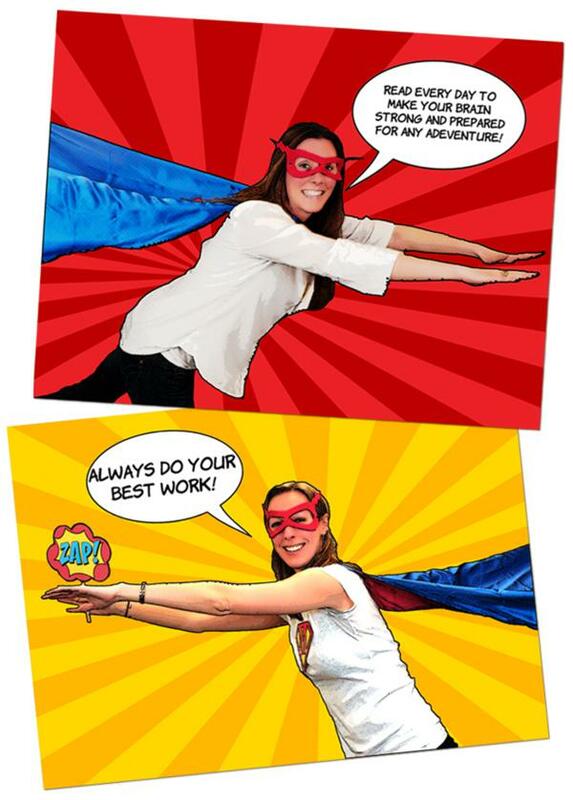 Originally I had planned on using the pictures John took as is, but then I got the great idea (if I do say so myself) to turn them into comic book style posters with advice from each staff member to students. John transformed each photo into a comic book style poster which I used to decorate the hallways, and an 8×10 photo for the classroom doors. And all of it is gorgeous, fast, and extremely affordable. The posters were a HUGE hit with the students. In fact, when I was taking them down at the end of the week (while wearing my awesome Supergirl shirt) a little boy said to me, Why are you taking the posters down? You arent a superhero! You are a villan! For me that was the ultimate compliment. I am so happy everyone enjoyed the superhero theme as much as I did. The moral of the story: If you are planning a school event, be sure to utilize your school districts print shop.  pictures to color for their teacher. On Monday, the students presented the pictures and notes to their teachers, and the room moms came in and put them on the classroom doors along with the 8×10 superhero photo.  pictures in the office for students to color. Many of them wanted to make pictures for past teachers, the music teacher, librarians, etc. There was a poster in the stairway letting them know where extra pictures were located. Now that the groundwork was laid, I focused on the activities for the week, each one being Superhero themed, of course. I used SignUp Genius to coordinate sign ups with the Hospitality Committee and Room Parents for these activities. I made everything look pretty, but I couldnt have pulled off an event like this without the wonderfully supportive parents at our school. We had eight different varieties of gourmet popcorn for the staff to enjoy throughout the day. After listening to feedback from last years gourmet popcorn bar, we made half of the flavors sweet, and the other savory. If you have never made gourmet popcorn, dont be intimidated! You can find all sorts of fabulous popcorn recipes on my Simply Pop! Pinterest board. The parents made boxed lunches for every staff member at the school. As I mentioned, I included a questionnaire with the invitations asking the following questions: What is your favorite sandwich? Favorite bread? What do you like on your sandwich? Favorite chips? Favorite salad? Favorite dessert? Favorite drink? Favorite dessert? Any allergies? I asked that the questionnaires be returned by the Thursday prior to Staff Appreciation Week. Once I received them, I forwarded the answers to the parents who signed up to make lunches. Once again, the parents blew me away with their creativity! TIP: The lunches at our school are staggered from 11:15-12:30 so this year I sorted the lunches by time on six foot tables at the back of the room. Sorting the lunches by time made it a snap to find the lunches, and having them on a table in the back (instead of the lunch tables) gave the teachers and staff plenty of space to eat their lunch. Purchasing lattes for the entire staff is a huge portion of the Hospitality Committee budget each year. The week before SAW, Starbucks offered a $5 for $10 Gift Card Groupon. I couldnt have timed it better if Id tried! Each person was limited to one Groupon, so I sent an email to the entire Hospitality Committee and asked them to please purchase a Groupon and email me the certificate. (I reimbursed them out of my budget.) I also did this earlier in the year with an Everything Party Groupon, knowing that I would be buying decorations, silverware, plates, etc. 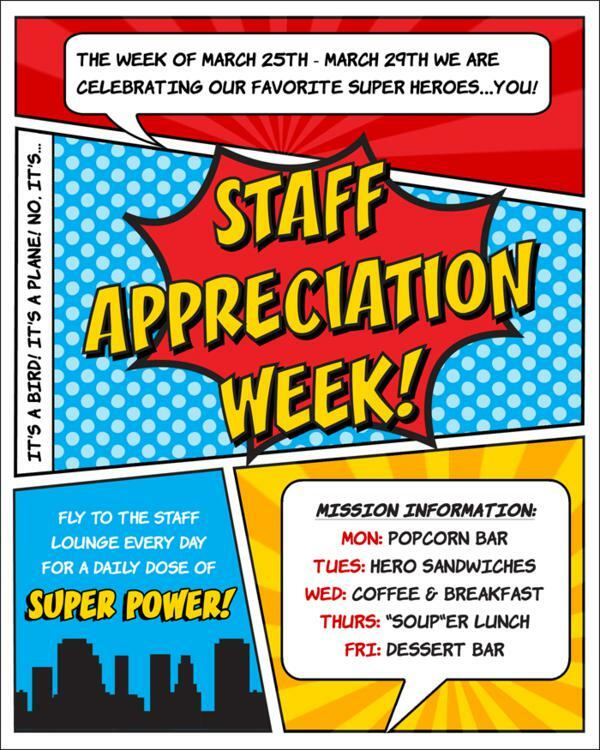 for Staff Appreciation Week. I was able to reduce my expenses by about $150 this year using Groupons! I took 1/2 the orders to the Starbucks about a mile away, and 1/2 to the other Starbucks a mile the other way. (Remember, I live in Seattle. Were surrounded.) I pre-paid for all of the drinks to make pick up easy for the 4 parents picking up the 40 lattes the next morning. The baristas loved the sticker labels. They quickly and easily made the pre-ordered drinks and attached the labels. The drinks and breakfast were waiting for the teachers/staff at 7:50am. I wanted them to have time to enjoy their breakfast before school started. I have paid close attention to what the teachers and staff eat at our Hospitality Committee events over the last year. The overwhelming majority are very healthy eaters and eat very few sweets. In fact, at the Super Charged Breakfast this year, the majority of the food I asked for was fresh fruit and Kind Bars. Yes, there were a few dozen muffins and bagels, but those were eaten much more slowly. So, I created a dessert table with a mix of bite sized treats and traditional favorites provided by some amazing dessert vendors! For those that didnt want a cupcake (say what?!) we had gorgeous macarons from The Splendid Sweet Shoppe. I have the utmost admiration for anyone who can make a beautiful macaroon. These were amazing and so colorful! Sweet Tweets made AWESOME super cookies with an M instead of S. I was seriously impressed. 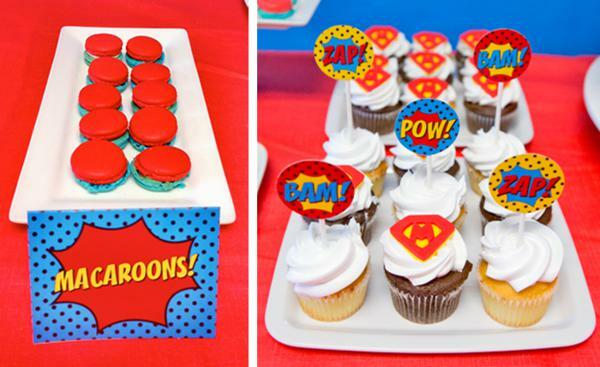 I used some of them for the dessert table, but the majority of the cookies were wrapped in cellophane bags and tied with a Thank You! tag to take home along with their Superhero Award to enjoy later. The highlight of the dessert table was definitely the cake pops from Decadent Cake Pops. The owner, Jaime, and I met at our childrens preschool a few years ago. I have ordered cake pops from her in the past and my girls love them. Last year I discovered that both of my girls are highly sensitive to gluten, dairy, and eggs which excludes them from all of the fun birthday treats children have at parties and/or bring to school. I asked Jaimie if she could make me gluten free/vegan cake pops, and she did! I now keep a stash of GF/Vegan cake pops in my freezer at all times. When anyone in my daughters classes bring in a birthday treat, I pull out a cake pop and send it with them to school. Cake pops are my new favorite thing. 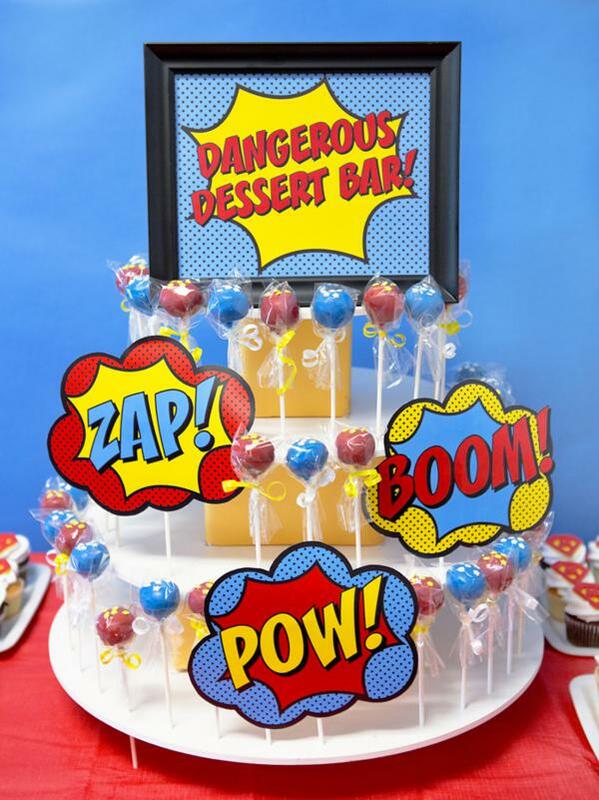 These superhero cake pops were the normal variety, but its nice to know there are delicious and fun options for those of us dealing with food allergies. 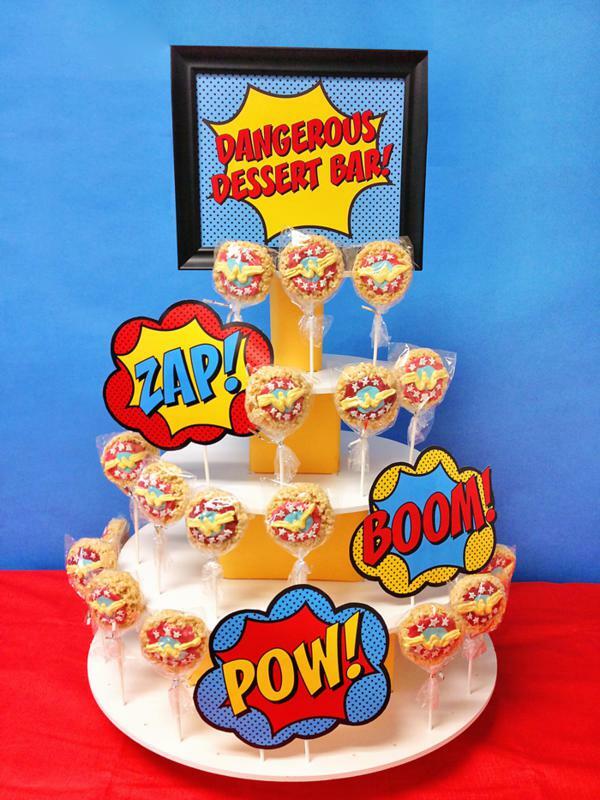 Speaking of food allergies, Wickedly Whipped made Wonder Woman Rice Krispy pops (yes, those are real!) for everyone, but especially for those staff members that cannot eat gluten. Who am I to deprive someone of treats? Who doesnt love Rice Krispy treats?! Unfortunately the mail man didnt deliver them in time for lunch on Friday but they did arrive before school got out for the day so I whipped up (get it? ha!) a quick display of take home treats for the staff. The teachers and staff also took home a Superhero Award at the end of the week. They are after all, the most amazing superheros I know. Hi! Is there any way I can get a copy of your super cute pic that the kids can fill out? We’re doing a super hero theme this year too, but the dates are different. Thanks so much! This is fantastic! I’ve been trying to come up with a cute theme for our teacher appreciation but have been stumped. This is so perfect! 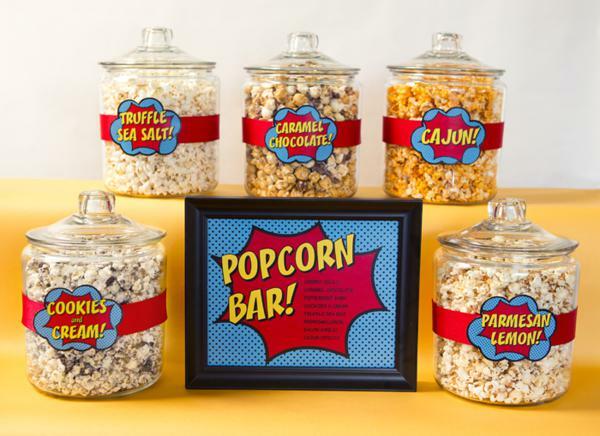 I’d already decided to do a popcorn bar one day, so it’ll fit right in with this :) Thank you for sharing your ideas! I LOVE the idea of the pictures of the teachers. Does the photographer have a website or a way if we emailed him the pictures he can edit them and send them back? Thanks for sharing your ideas. Can you please tell me what it says on the sign the day of your Popcorn Bar? I love this idea? Can you send me the PDF of that sign so I can print one? THANK YOU!!!! Are you sharing your printables? LOVE these ideas. Can you tell me where I can find the printables? Thanks for sharing! I love, love, love this idea. Our teacher luncheon is coming up this month and I am always put in charge of organizing and like to go “outside the box” when choosing a theme. Even though it is Thanksgiving, I would like to do something more unique and never done before. After looking at your website and idea, OMG!! I love this. After speaking with the parents’, we have decided we are going to do “Giving Thanks to our Superheroes” (meaning the teachers and staff). 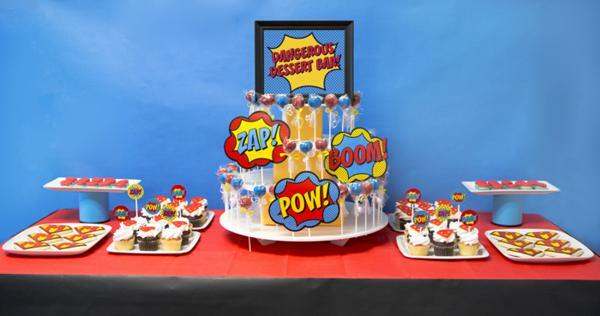 Does it cost anything if I asked if you could send me a copy in PDF form of the dessert bar sign or where I could download it? And also the ZAP, BOOM, POW, and INSTANT ENERGY? Just asking because this idea is too good to pass up. I appreciate your time and thank you again for such a wonderful and inspiring idea!! I love this idea…our “mild mannered” staff is secretly changing lives! The only problem is I have over 850 people to do something for in mailboxes! This is such a great idea! Are you willing to share your printables? 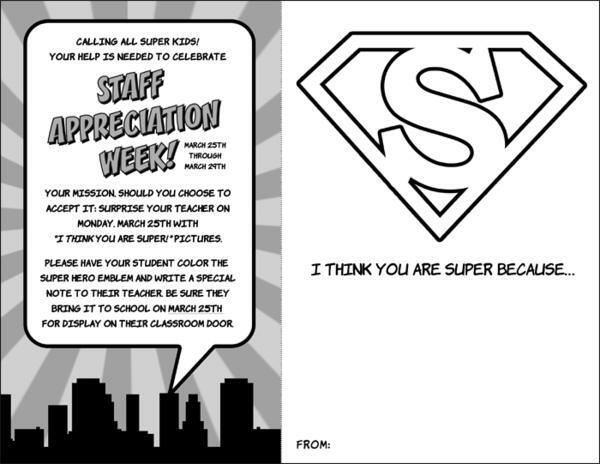 I am helping coordinate staff appreciation for my PTA unit in April and would love to use some of your ideas….especially the printable about Why my Teacher is Super. Thanks! I hate to sound like a broken record but I agree with all the comments before on how adorable this theme and your execution of it is- Are you sharing printables? This would be a fantastic theme for our school. Please advise and THANK YOU. Love it!! Can you send me the printables! Are you selling the printables? I love your Superhero Teacher Appreciation stuff. Are you selling the printables? How much? We will be using this at our teacher appreciation next week. Are you selling the printables? I would to have the printables sent to me. Hi! I’m writing from Guatemala and I just LOVE all that you did! I’m a mom, and I just requested authorizacion for us parents to held a Teacher Appreciation Week at my daughters school. So thank you so much for sharing! I’m kind of in a huge hurry, as next Wednesday is Teachers’ Day here in Guate, and it´s Friday now, and even though moms are really happy about the idea, like the others who wrote you, I’m wondering if you are sharing the printables. That would help me tons! I love all of your wonderful ideas. I used to be a teacher, so I know how much appreciation is needed! I am in charge of teacher appreciation for my kids’ school and I want to make it extra special. Can you send me your templates? Thank you so much for sharing your ideas. These are AMAZING!! Wondering if you will share your printables? We would also love to know if you are sharing or selling the printables! Thank you!! I would love to use these printables for a “New Teacher” celebration. Where can I download them from? If you are sharing/selling printables we would love to use a few of them ! This will make the week we are planning even more exciting! I too would love to use this idea. Are you willing to email your templates used for this event? Thanks! This would be perfect for our school! Are your printables available? Are you selling this template? I would love to use this for our teacher appreciation week! Thanks! 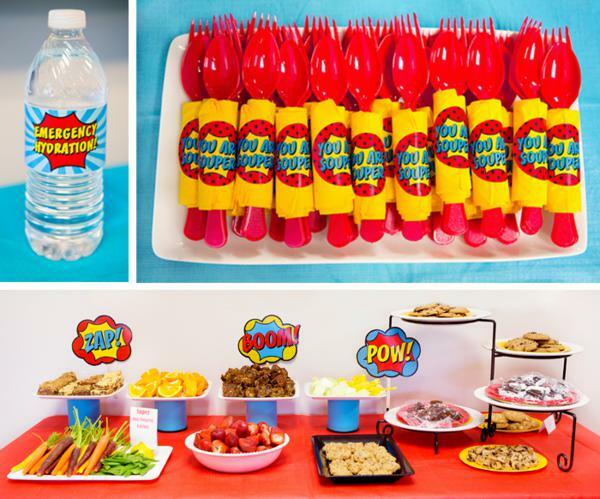 How do we obtain the printables for the Superhero theme teacher appreciation event? I am responsible for Teacher appreciation week at my daughter’s school. Please let me know how much these forms will cost for you to send them. Incedentally, she is the one who did the printables for this party post featured on our site. XOXO! Can you please share with me the templates for all of the foods, flyers etc? Could I please get your templates…I love your ideas for celebrating teachers!